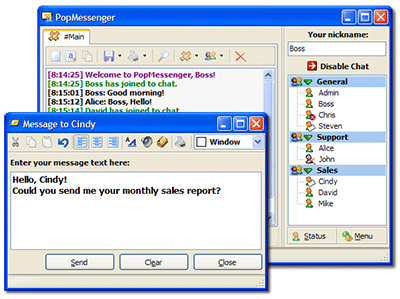 Chat software for LAN (local area network). Winpopup replacement. LAN chat and messaging solution for both small and medium enterprises! One of the key factors of successful business operation is well-thought staff communication system. This complete small to large enterprise level instant communication solution offers full range of instant communication tools that do not require a dedicated server or usage of third party services. Whether you chat on public or private channel, send messages or files, you can enjoy maximum security and ease of use. The application combines power of the latest technological achievements with ease of use and intuitive user interface. It comes with flexible licensing policy and a FREE trial version! So, why waste time on ill-thought communication solutions? Try PopMessenger today! Configurable sounds, colors and fonts. Fast, Clean, Simple. Thanks for a great program. Jim Sillasen. The Voit Companies. Love your program - I found it on a cover CD on a computer magazine - keep up the good work. We found your program through software archive on the Internet. Reasons for purchase. Ease of install. Easy to set-up. User friendly interface, not complicated. Raymond Knight. Unwin Safety Systems. I also wanted to tell you that Pop Messenger is without a doubt the best program of it's type I've ever seen. I tested probably 15 different ones over the last 6 months looking for something that was absolutely user friendly in every way, especially for users that are not computer literate, and nothing even came close. I really love this program, and no slander intended against women at all, I am one, but when I was running it in testing, I wondered if your programmer had ever worked in an office full of women (I have, 40 in one dept), because it does away with any questions on 'how to's', or complaints of 'don't undertand's. This is the only program I've ever installed on any of the three networks that I didn't have to teach anybody how to use it. A couple of the best things about it are: 1) the fact that the program automatically maps to all users on the network with no intervention; 2) automatic message logging both off and online; 3) ability to send an offline message. Thanks again.